The Statue of Liberty reopened today, Sunday, Oct. 13, under an agreement reached by New York State with the federal government on Friday, October 11. Under the agreement, New York State will fully fund National Park Service personnel at the daily cost of $61,600 to keep Liberty Island National Park open to visitors as the federal government shutdown continues. As a result of the federal government shutdown, the U.S. Department of the Interior closed all national parks across the country last week and furloughed more than 20,000 National Park Service employees. In response to the economic impacts that park closures have on local communities, the Department is considering agreements with Governors who indicate an interest and ability to fully fund National Park Service personnel to reopen national parks in their states. These payments will not be reimbursed unless Congress passes a law to provide refunds to individual states. Under Governor Cuomo’s agreement with Department of the Interior Secretary Sally Jewell, the State will pay for the first four days of reopening the park, with funding coming from the State’s tourism budget. To keep the park open, the State must give the Department two days’ notice for every additional two days. The park will be fully open and functioning as usual. The State will pay the federal government $61,600 for each day that the park is open. 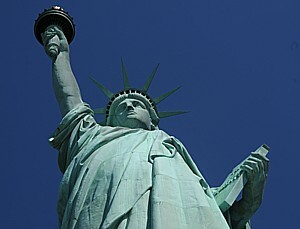 Liberty Island National Park has a major impact on the New York State economy. According to a 2012 annual report by the National Park Service, 3.7 million people visited Liberty Island in 2011, generating $174 million in economic activity and supporting 2,218 jobs. Every visitor spends an average of about $35 for the ferry, food and souvenirs at Liberty Island and Ellis Island. Additional expenditures outside the park are estimated to be as high as $100 with each visit. The park generates more than $15 million in revenue from concessioner and franchise fees for the federal government, as well as $3.2 million in license fees to New York City parks plus sales taxes. As a result of the shutdown – which has denied access to more than 10,000 visitors to the park daily – more than 400 direct jobs have been lost at the Statue of Liberty and Ellis Island, including with the National Park Service and Evelyn Hill, Inc. Statue Cruises which provides ferry rides to the island has seen its daily ridership drop 50-70 percent, and the company now has 180 jobs at risk. In addition, the federal government itself is losing $50,000 per day in concessioner fees. This shutdown also follows an 8-month closure of Liberty Island due to Superstorm Sandy. Ellis Island remains closed to the public. This entry was posted on October 13, 2013 at 7:01 pm and is filed under attractions, National Park Service, National parks, New York City, New York State tourism. You can follow any responses to this entry through the RSS 2.0 feed. You can leave a response, or trackback from your own site.